To be honest, 3-0 after 3 is no reflection of the tightness of the contests, or the gap between the teams. I have a lot of respect for the power of this English team, and especially its batting potential. Even this morning I pondered the odds of an English victory, because in my view, Pietersen is good enough a batsman to orchestrate it. He just needed someone to stay there at the other end. He was unbeaten at the end as well. How much harder Australia would have had to work if Hoggard, a tough defensive batsman, had been able to hold an end up with him, I leave to your imagination. But how do I feel? This picture sums up my feelings. I’m having a Bundy Rum and coke, and lapping it up! 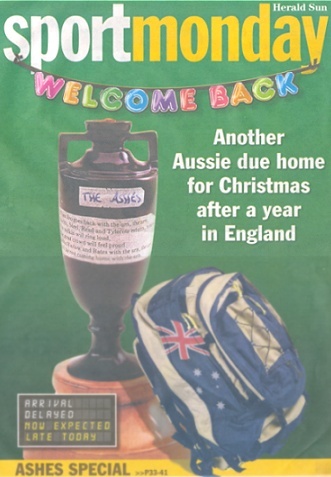 This entry was posted in Cricket and tagged ashes, australia, bundaburg-rum, england, england-in-australia, gloat, joy, kevin-pietersen, the-ashes. Bookmark the permalink.